Sanibel-Captiva Lions Rick Wagner, second from left, Jeff MacDonald and Bob Kern, present a donation to Southeastern Guide Dogs Carole Bloom, left, and Ron Bloom, right. 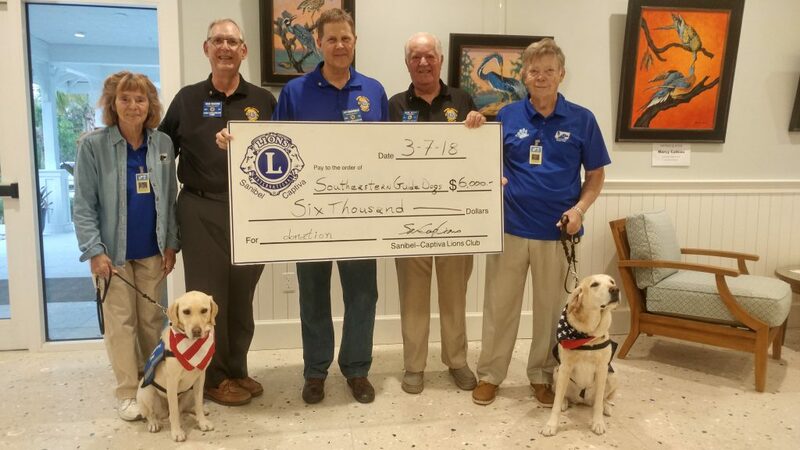 The Sanibel & Captiva Lions Club has been a longtime supporter of the Southeastern Guide Dogs organization that pairs well-trained dogs with the visually impaired and veterans who suffer from Post Traumatic Stress Disorder. It’s for those who cannot see and those who have seen too much. The public is invited to meet Southeastern Guide Dogs during the 35th annual Lions Fine Arts & Crafts Fair. There are more than 100 exhibitors and silent auction items, as well as amazing raffle items, food and beverages. It’s from 9 a.m. to 5 p.m. Friday, March 16 and 9 a.m. to 4:30 p.m. Saturday, March 17 at the Sanibel Community House, 2173 Periwinkle Way. 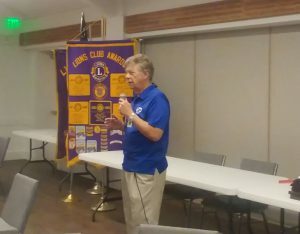 The Sanibel-Captiva Lions Club meet the first and third Wednesday of each month at the Sanibel Community House. Visiting Lions are welcome.